Federal’s Fusion line of deer hunting ammunition has been one of the top hunting rounds available on the market. 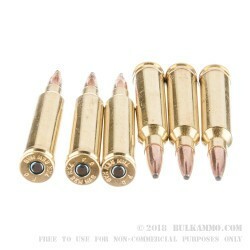 With their innovative skived-nosed design and electro-chemically applied copper jacket, these rounds allow for deep penetration and weight retention, making for a round that’s terminal at any distance. The jacket and lead core are fused together, which eliminates separation and allows for maximal energy transfer. The boat tail, increases aerodynamic efficiency, making for an extremely accurate projectile. Known for offering the largest expansion in a deer round, the Fusion line is the ultimate tool to bring home even the biggest buck this season! 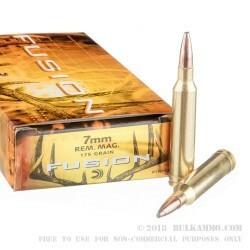 These Federal Fusion 7mm Magnum rounds come 20 to a box, and are loaded into boxer-primed, noncorrosive reloadable brass cases. The 175-grain projectile is capable of a muzzle velocity of 2760 FPS and is more than capable of taking down even the largest deer or elk. 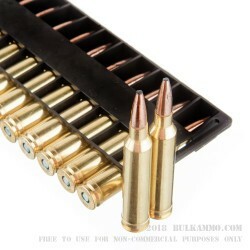 Federal Premium for nearly 100 years has been a reliable producer of sporting ammunition and is based in Anoka Minnesota. Over the century they have forged a reputation American-made quality.